Like many of you, I’m sure, I find it much easier to get enthusiastic about plants than tools, though I’ve certainly collected my share of both classic tools and over-hyped gadgets over the years. My most recent disappointment in the the latter category is those crinkly, lightweight, flexible hoses that expand when you turn on the water and contract when you turn it off. My first one lasted two weeks before it started to leak; the second one lasted two days. There won’t be a third. I also own a couple of traditional shovels—one with a thin, light blade for moving mulch, and one with a thicker, heavier blade for serious digging—but my favorite is a mini D-handled shovel, which I use for most of my planting and transplanting projects. It’s barely 2 feet long, so I can use it either kneeling or bending over, and its small size makes it easy to work with in even crowded borders. As with my good spade and fork, the handle on my mini-shovel is so worn that I can’t even tell for sure what brand it is, but I think it was this one from Black & Decker. There are a couple of other brands too, and since all of them sell in the $10 to $20 range, you probably couldn’t go far wrong with any one of them. Another tool I’d hate to be without is my hori hori knife. 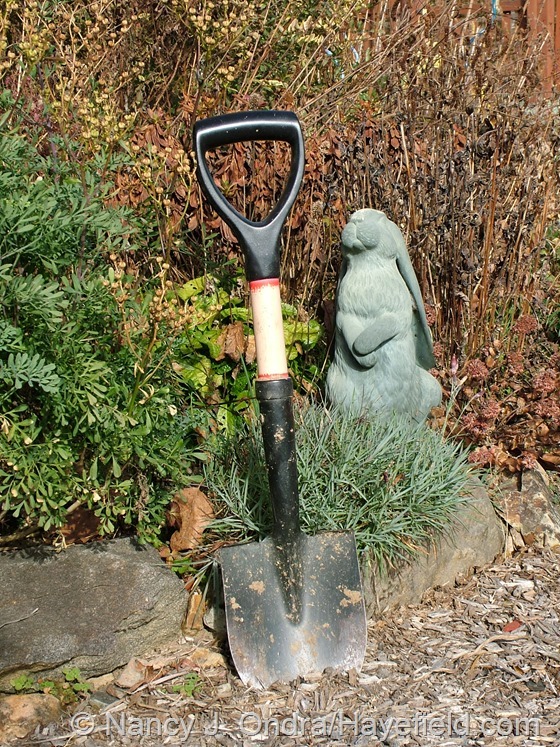 It takes the place of a trowel for planting annuals and bulbs, and the serrated edge makes it my tool of choice for dividing all but the biggest or toughest perennial clumps. Mine is about 6 years old now, and though the handle is a little loose, it’s still a joy to use. This knife used to be somewhat hard to find, but there’s a variety of brands at a range of price points now. I’ve tried a few cheaper versions, with plastic handles, but the blades dulled quickly, making them little better than an ordinary trowel. When I decide to replace my good one, I’ll be looking at one like this: Hori Hori Knife on Amazon. For cutting, I own a half-dozen of so pairs of pruning shears, all currently in various states of disrepair. My two pairs of Felcos need replacement parts, which I continually forget to order, so I’ve ended up buying cheaper Corona shears and just using them until the blades twist or they’re too far gone to sharpen effectively. I was beginning to wonder how I was going to get through my garden cleanup this season when Tim arrived and handed me his “you have to try these” shears. The Jakoti hand shears are exactly what I’ve been wishing for for years: one tool that serves the purpose of pruning shears, garden scissors, hedge shears, and grass shears, and that you can use with just one hand (either right or left). Now, to be fair, they’re not meant for “real” pruning on woody plants; for that, proper pruning shears are still best. I’ve used the Jakoti shears to cut through woody stems up to about 1/4-inch in diameter, just to see if I could, but I’m not inclined to take the experiment much beyond that because I really don’t want to find their breaking point. I did try them for trimming a boxwood, though, and they made a really nice cut. I wish I’d had these when I had to hand-trim topiaries and parterres on gardening jobs. Where the Jakoti shears really shine are for general garden cutting tasks. So far, I’ve used them in place of my usual garden scissors for harvesting lettuce and other greens, for gathering herbs (even tough-stemmed ones like rosemary), and for tidying up some late-blooming perennials, like Mexican fleabane (Erigeron karvinskianus). I can already tell that they’re going to be fantastic for my main plant-shearing projects next spring and summer, when I give most of my perennials a hard cut-back to control their size and/or delay their bloom time. 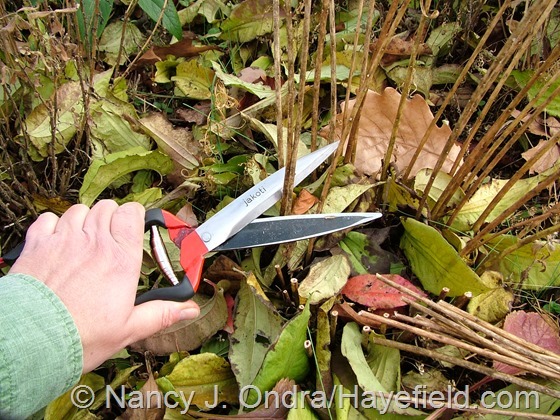 The long cutting blades should make deadheading perennials and groundcovers go a lot more quickly, as well. What I’ve mostly been using the shears for during the past few weeks is for my end-of-the-season garden cleanup. As I’d hoped, they are terrific for ornamental grasses. In the past, I’ve used the technique of bundling the tops with a bungee cord and then using hedge shears, which worked fine when I could remember where I last left the bungee cords. But with the Jakoti shears, the job has been going a lot faster. 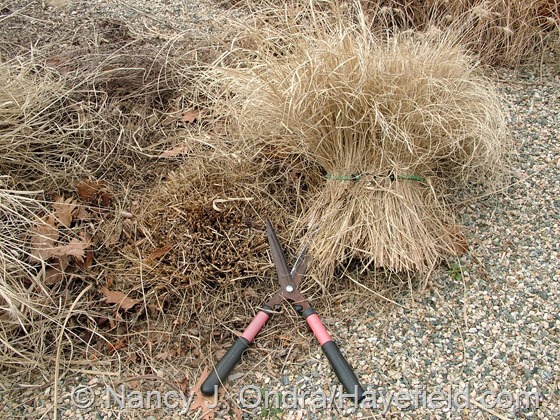 You can hold the shears in one hand and use your other hand to hold the stems while you cut, then easily toss the tops into a wheelbarrow or tarp. 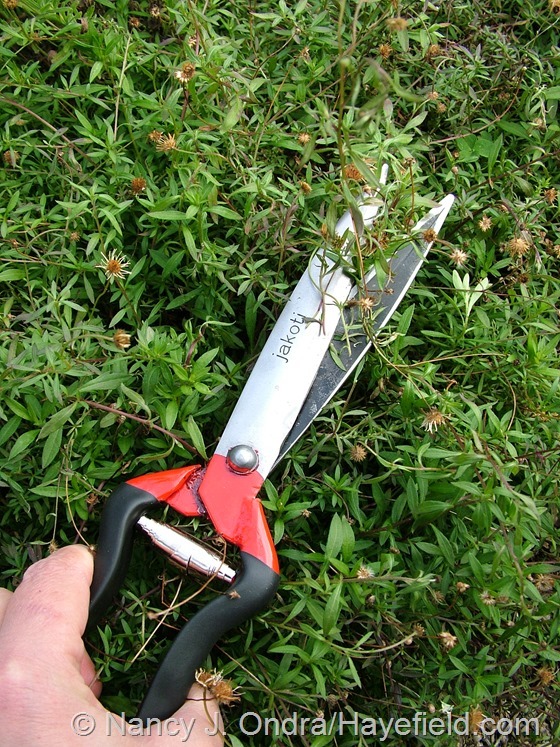 …and for cutting down those with woody stems, like bluestars (Amsonia) and asters (Symphyotrichum). 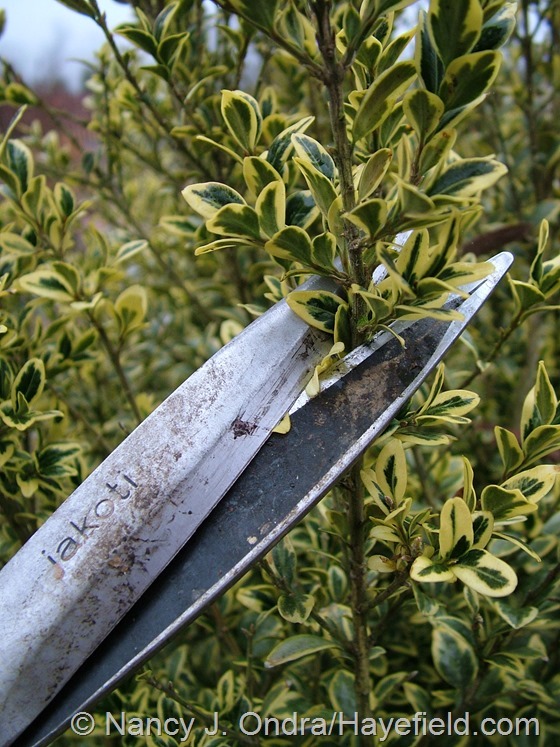 Anyway, when I poked around on the web to see what others had to say about the Jakoti shears, I was surprised to see that, so far, they’re not well known here in the U.S., and they’ve just started catching on with gardeners in the U.K. in the past 5 years or so. Even more interesting for me was seeing who else has been raving about them: folks with small sheep farms, who have to do their own shearing. 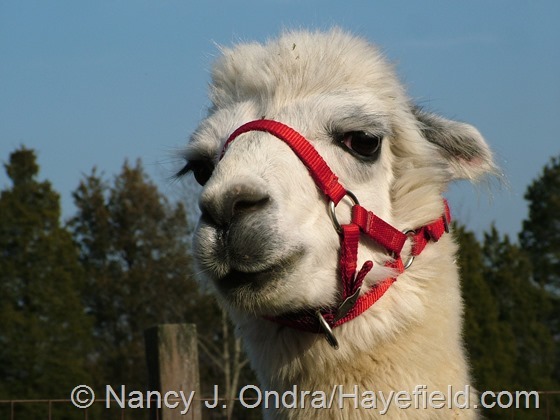 Oh…but what about alpacas? 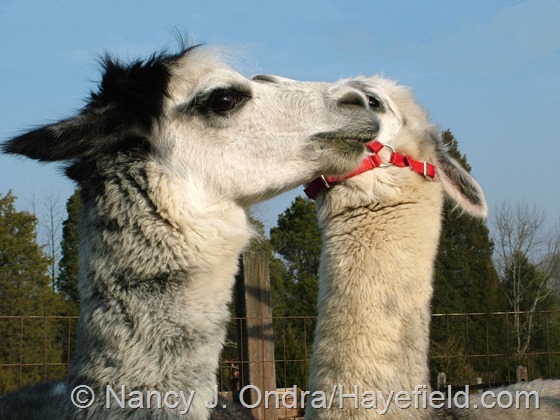 Sure enough, I found that they’re recommended by Marty McGee Bennett of CAMELIDynamics, whose gentle training and handling techniques I use daily with Duncan and Daniel. Like her, I prefer to shear my guys while they’re standing, instead of hiring professionals who usually take them to the ground, tie their legs, and stretch them out to use electric clippers on them. Sure, that would be a lot quicker, but I can’t even imagine my boys having to go through that, even if it would save them the indignity of walking around half-done between our hand-shearing sessions. Normally, I buy a pair of Fiskars Softouch Scissors for each of them every spring. These scissors do a fine job, but they’re really not meant for this sort of heavy use, and they’re usually pretty much shot by the time we’re done. 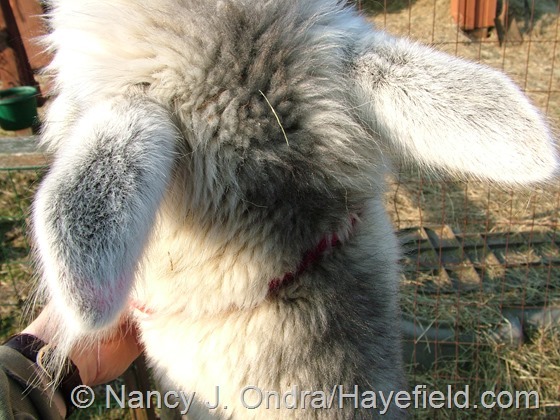 I can’t wait to see how the Jakoti shears will work out, but it’s obviously the wrong time of year for full shearing. I do like to trim behind their ears now, though, to let their halters fit more comfortably, so it was time for another experiment. 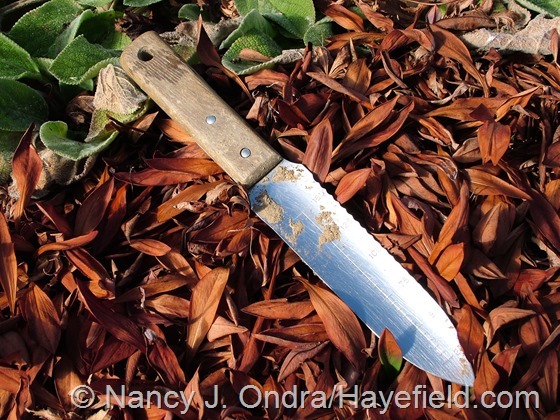 Even after a few weeks of use in the garden, the “self-sharpening” blades were still sharp enough to do the job. I asked the boys what they thought. They conferred. You really want to know what we think of the new shears? Honestly, we can’t tell the difference, but if Mom likes using them, we’re all for anything that will keep her in a good mood. Can we have something nice to eat now? Yes, thank you for that rousing endorsement, Daniel. I do think the Jakoti hand shears are great, and so does Tim…so much so, in fact, that he is now selling them online to gardeners and farmers in the U.S. at Jakoti Hand Shears or orders@jakotihandshears.com. Now, I have only one thing left to wish for: a place that sells right- and left-handed gloves separately. I know I’m not the only gardener who wears out one much sooner than the other—usually the left one, since my right hand is almost always holding whatever tool I’m using—so someone must have realized how useful it could be to sell replacement gloves individually. Anyone know of a source? Or are you still on the hunt for your own dream tool? Thanks, Rob! You’ll love the shears too, I think. They’ll be great for keeping that border along your sidewalk under control. Just in time for Christmas! These look like a great idea. I’ll be sharing the link with the appropriate Santa-designates. Or will come back myself, post-holiday. I love my Felcos, but it can sure take a while to cut back a full-grown perennial. Or many, many full-grown perennials. Hi there, Renee! I think Santa’s workshop is going to need to get busy to keep these in stock. I already bought a second pair for Mom’s stocking. Thank you! I cannot get these shears fast enough since I am in the middle of cutting the garden down. Bulbs are showing already, it seems to happen earlier each year. What a good sister you are! Oh, well…I try, you know. I can’t wait to hear what you and others think of the shears, Frances. As I said, I’ve been using them for only a few weeks, but I’d already hate to be without them. The only problem I’ve found so far is that they do not fit at all comfortably in a back pocket. Tim says that holsters are available, but he wasn’t impressed with them. Wow wow wow! These shears are so amazing, everything you said and more, Nan. Thank you for featuring them on your blog. My hands are small, arthritic and weak and the yearly big cut down is always difficult for me, no matter what tool I use. 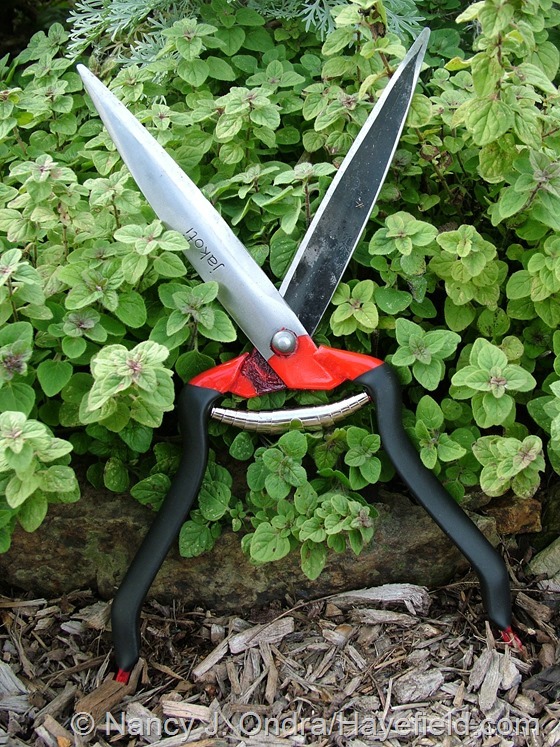 These shears have made the cutting a joy, easy to use and they cut quickly. I have used them two days in a row and my hands last much longer than my back. I highly recommend these shears to one and all! That’s absolutely terrific to hear, Frances. It’s wonderful the difference that one small thing can make in caring for a garden. I hope you’ll pass along your experience to other gardeners as well! The ‘BOYS’ are too cute. Heh…aren’t they just? Duncan’s rather modest about compliments, but Daniel can’t get enough, so I’ll be sure to pass along your comment, Melanie. You need a left-handed gardener buddy so you can trade one handed gloves. Well, now – that’s a fun idea! I should ask Mom about that. She was born left-handed but was forced to be right-handed, so I’m not sure which gloves she ends up wearing out. They sound like a great tool Nan. Self sharpening and the UK site sells a holster for them too, which would be useful as I am always putting tools down and losing them. So thanks for the post, another item (or 2 for my other half to treat me to lol). Sorry to cost you more money, Allan! I’d like to know what you think of the holster if you try it. Good tools are SO important. I got myself a tennis elbow on my right arm because I did all the weeding in the new allotment with one tool. Hopefully it will be gone come Spring. Oh, dear – it’s a good thing you have a few months to rest up. Britta. When you get absorbed in gardening, it’s just too easy to forget abut time and overdo it, even with the best tools! I could have sworn either Lee Valley or Gardener’s Supply would sell you a single glove, but I can’t find that statement on either site now. You could always ask! Well, if anyone would, it would be one of them, huh? Might be worth a try – thanks, Kathy. We may be on to something: a gardeners glove exchange! I was thinking the same thing! I usually wear out the ends of a couple fingers on my right hand glove and have to toss a perfectly good left hand one. Here’s another thought: how about individual replacement fingertips–kind of like rubberized thimbles that you could fit over the worn-out fingers of any glove? Hmmm…that could work! Great information, I am already starting to plan for this coming spring. Now, if we could just wish the pesky winter away so we can get busy growing again! Thanks for the scoop on the tools – I’ll have to look for both the shears and a mini-shovel. I’m always looking for gloves – I like to be able to feel what I’m doing so I gravitate toward lighter weight gloves but all those seem to wear out virtually overnight. Ah, the eternal search for the perfect gardening gloves. I’ve almost given up, but boy, doing cleanup is so hard on the hands that sometimes you just have to buy a new pair of gloves just to get through it. I’ll let it slide this once, bro. I really am glad you let me know about these shears! I’ll start by pointing out the obvious: your brother is cute. Now that THAT’S out of the way, I’m relieved to know I’m not the only one with a collection of dull and/or irreversibly past-their-prime shears; pruners as well. It’s been a source of secret but deep shame. As for the broken fork, to me it looks like a boot scraper. It’s not fair, Erin: he got the looks, the charm, and the quick reflexes. Oh well! I know…I occasionally resolve to take much better care of my tools, but it usually doesn’t last long. It really makes me appreciate the ones that can put up with benign neglect and still work when I need them. 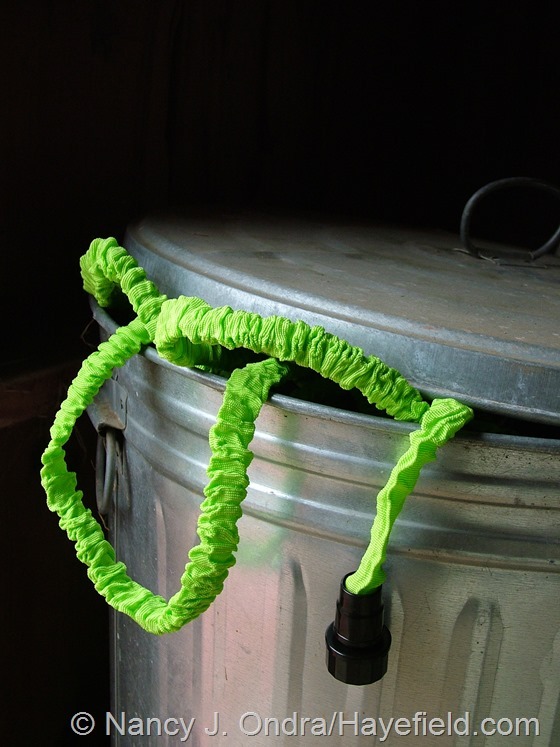 A bootscraper – certainly something I could use! Thank you – and your lovely brother – for the tip! Now I hope the branch in UK can sell me a pair – or they can advice me where I can find them here in Sweden. 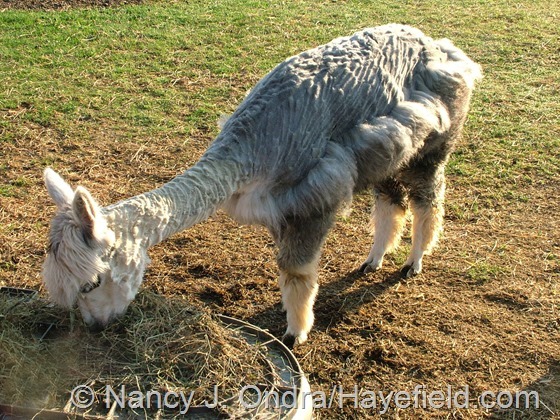 Seams perfect for me who has a lot of ornamentel grasses….. I can’t imagine that it would be a problem for them, Susie. I hope you *are* able to get a pair; you’ll wonder how you handled all of those grasses without them. Loved your post, Nan. And those sheers are on MY wish list too. 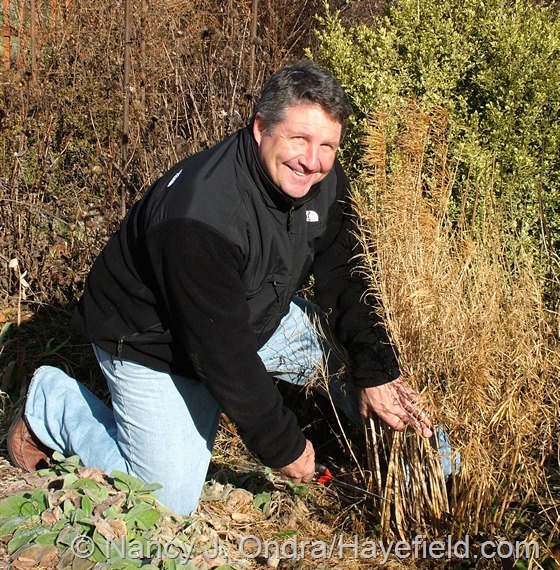 I had to chuckle – we call my husband “Inspector Gadget” — I don’t think there’s a gardening gadget that has ever been sold that we haven’t owned at one time or other. But like you, my favorites are old favorites… I have a similar gardening knife, a set of Florian bypass rose pruners, an orange handled hoof trimmer that a local farmer uses for trimming his goat’s hooves….. that thing is sharp, easy on the hands, and my all around FAVE cutter (I have to keep it hidden as everyone wants to use it and they disappear like crazy), a small expandable rake, and a spade shovel. I’ve yet to find a set of shears that really worked well so I’m exited to see your recommendation! 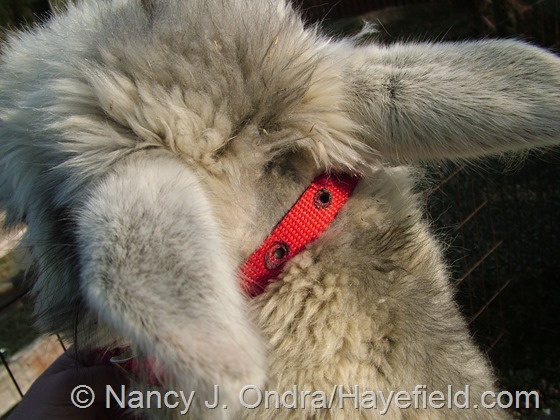 Aaah, yes…those hoof trimmers are brilliant! I have a pair for doing the boys’ nails, but I make sure I keep them put away in the barn so I’m not tempted to use them in the garden. Those expandable rakes are pretty handy too. I don’t know that I *need* them, but I know I really *want* a pair of these now. Er…someone who unwisely planted one right next to a heavily traveled path but is too lazy to try to move it? Hypothetically, of course. Great article. I need some new shears. They sound great. I am glad I didn’t ever succumb to the wrinkly hoses. I figured they sounded too good to be true. Love seeing “the boys”. Those soulful eyes always get me. You are blessed to have such a brother. Hi Lisa! There’s just no way to fix those hoses, that I know of, so once they start leaking, they’re done for. I’m really disappointed that they didn’t work out. And yes, it’s hard not to fall for those big, dark eyes and long lashes, unless you know the deviltry that can lurk behind them! I’m always losing tools in the yard too, for lack of a good holster. I actually dug up a couple of rusty bypass pruners this summer. 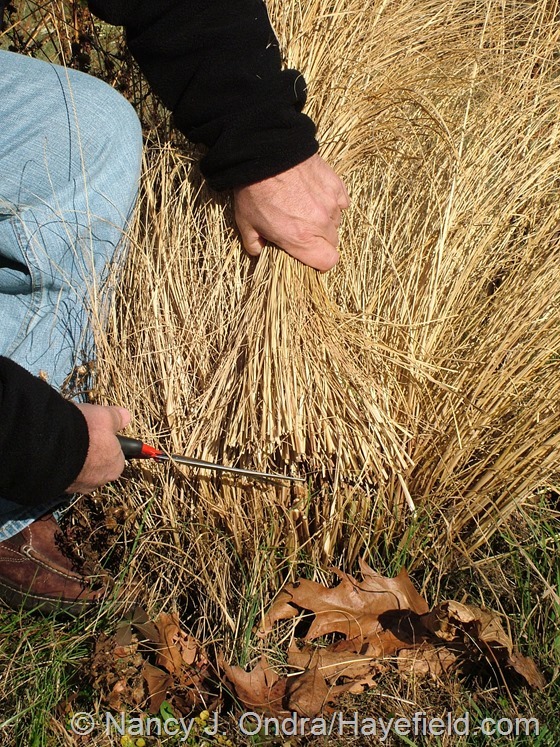 The shears sound like a great all-purpose gardening tool too. I also like to use serrated knives, much like the hori hori knife, for weeding and minor digging. I tend to lose more right hand gloves, since I am always pulling them off to do something then dropping or burying them. I found some great gloves at the hardware store, made for mechanics, that have rougher latex on the fingers for a better grip on those pesky weeds, Diesel Pro Tekk, and they are inexpensive too. Thanks for the tip on the gloves, Hannah. I usually end up buying the Mechanix brand; I’ll have to see if I can find the ones you suggest. I broke my last set of shears this year for good, maybe these should go on my Christmas list! I almost tried those hoses but didn’t, guess I made a lucky choice! Hey there, Dave. You’ll still need a pair of regular pruning shears for actual pruning, but I think you’d get a lot of use out of these too. Hi Nan, I just put in a request for 2 shears! Thanks for the information and review of them. I’m sure if you and your brother think they work great, it’s probably just what I’ve been looking for. I usually use a big serrated bread knife to cut my grasses which I often worry I’ll slash my leg with as I’m wildly whacking away! This will be a much safer option for me! LOL! I really hope you’ll like them too, Susan. 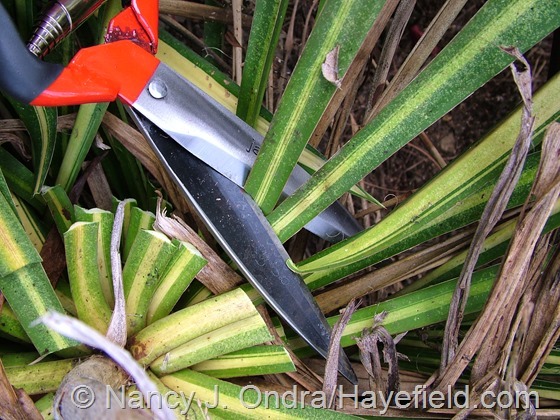 It takes a little while to get used to the longer blades, especially when you’re cutting through grasses and other bushy plants, so be careful with the wild whacking! Received my two pairs today. One for me and one for my mom. Can’t wait to try them out! Also wanted to mention that the scrunch hoses worked really well for me this year, but we have quite low water pressure. The tube inside is so small, I would imagine with good water pressure it wouldn’t hold up. For once I’m lucky to have low pressure! They made watering pots and smaller areas much easier. All of my other hoses are the huge heavy rubber hoses that weigh a ton. Not sure how these cheap hoses will hold up over time though……. Hi Susan! It’s super that Tim got the shears to you already. If your weather has been anything like ours, it may be a while before you get to use them, but they will be worth the wait. That’s great, Judy! It takes a bit of the surprise out of your Christmas, but I think you’ll find it’s worth it. Thank you, Inna. I wish you happy sprouting come spring! I have used them three days running and love these shears more with each use! They will cut grasses and spent perennial stems with ease. For thicker, tougher stems I do have to use both hands, but am still mowing the garden down on hands and knees in record time. This year, I will even beat the Hellebore buds being clipped accidentally! Oooh, yes – they’ll be great for cutting down the hellebore leaves. Ours are snowed in right now, but once we get a melting period, I’m heading right out to do mine. Thanks for the reminder, Frances! 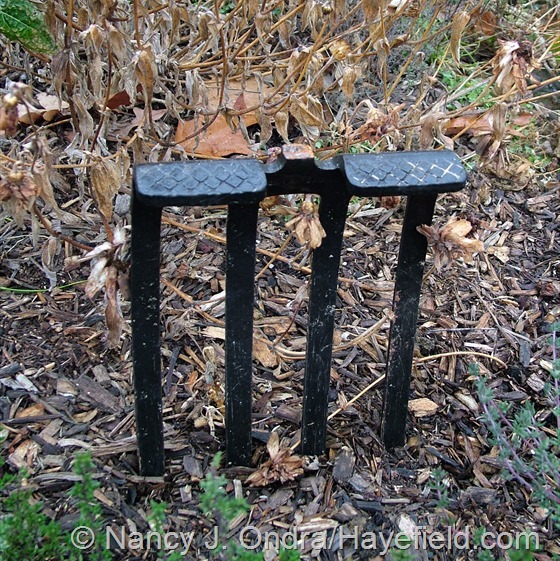 The moment I saw the broken-off tines of the garden fork I thought: dig a hole near your shed, pour in cement, set broken tool at an angle at a comfortable height and voila’, the flat tops on each side are foot scrapers. Thanks for the idea, Nancy. I’ve also been thinking of finding a way to bend the tines up and mounting the whole thing on a wall or fence to hang stuff on. Nan, I have a bundle of right-handed Atlas nitrile gloves sitting in a basket because I hate to throw them away. Surely there’s a gardener somewhere who needs them! I would happily send them to any of your readers. We need a garden bloggers’ barter board! I am ordering those shears! Ah, you’re another glove collector, Cindy? I know what you mean about not wanting to throw them away. Have fun with your new shears! I just ordered the shears from Tim and he has already shipped them. I can’t wait to get them and try them out. I have some grasses to cut back later this winter. As for the gloves… well, there are gardening gloves all over the place here, and I suspect one or two are buried in the compost piles. Oops. Hmmm…I hadn’t considered the possibility of recycling my extra gloves by composting them, but it would be better than throwing them away. Worthy of further study, certainly…. It’s great to hear that Tim’s keeping up with the deluge of orders. I look forward to hearing what you think of the shears once you’ve had a fair chance to put them through their paces. If anyone can speak about garden tools, it’s you! Well, I am working on ordering a pair of these shears. No pruning here for a while but I do need a good pair of shears! Also love the hori hori knife and my other favorite is the Cobrahead weeder. I just ordered 3 of those for Christmas presents. Thanks for the report on the weeders, Layanee; I’ve not tried them yet. I hope the Jakotis end up being the newest addition to your list of top tools. Just a quick note to everyone who purchased the Jakoti shears. I have been using them for the past couple months and have found that spraying the blades with silicone or WD40will keep the blades cutting clean and also from rusting. I do that with all my tools! Thanks for that tip, Tim. I’ve been following your advice but forgot to mention that in my post.